In White Sulphur Springs, Montana, atop the highest hill in a high mountain valley, is a wonderful stone castle. WSS, was a real western town of 1000 people with 10 bars, each bar with its own dog. Lived there as a child in 40s. Castle had been turned into an apartment house. Think it now restored with antiques and a place to visit. Other end of town is large home once owned by the Ringlings (Circus Ringlings). Short distance away is town of Ringling -- heard Jimmy Buffett's Ringling, Ringling? A visit to the only bar there inspired this neat song. To the north - the ribbon of the Smith River segmented his homestead meadows; to the west - vast reaches of the lower valley converged at the horizon back- dropped by the Big Belts; to the south below the hill - a growing community nestled in the vaporous springs area- to the east - majestic peaks of the Castles circled the open parks. All this Byron Roger Sherman viewed in panorama from the bluff. It was at this spot he chose to erect his "Castle," a permanent memorial to his efforts in helping to develop the hamlet of White Sulphur Springs. Born in Moriah, New York, August 20, 1841, schooled in Hazel Green, Wisconsin, Sherman yielded to the wanderlust of youth in 1860 and he headed down the Mississippi. He joined a wagon train, destination Montana Territory, eventually reaching Diamond City and later a homestead claim in the Smith River Valley. In addition to ranching, he operated stage lines between WSS and Neihart, Castle and Townsend. Considerable profits were also realized from silver mines in Neihart and Castle. The "Castle" on the hill, finished in 1892 at a cost of $36,000 was constructed of granite blocks hauled from Cottonwood Creek, 12 miles southeast of town by Wesley Curnutt and his crew of men and ox teams. Ole Opshall was the stone cutter while the best of craftsmen fashioned imported hardwoods for the intricate interior woodwork. Huge window glass was hauled from Townsend. Modern conveniences - acetylene light plant, furnace, lights - were installed by a Helena contractor. Anthracite furnace coal was shipped from Pittsburgh. A windmill pumped water into the attic storage tank for household use. 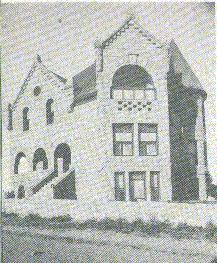 Charles H. Sherman, who took over the property from his father in 1902, sold the "Castle" to Michael Donahoe of Seattle in 1905 when he established ranching interests in the county. The elder Sherman died in Glendale, California, at the age of 85. 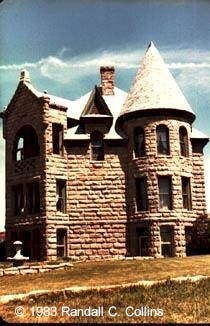 The Donahoe heirs, Walter, Charles, and Kathleen, donated the "Castle" to the Meagher County Historical Society to be used as a historical museum. As such, it was officially dedicated to on August 30, 1967, during ceremonial activities featuring Mayor Julius Lehrkind, President of the Historical society and Mr. And Mrs. (Bobbi) Walter Donahoe. 2nd photo located by Katrina Price.